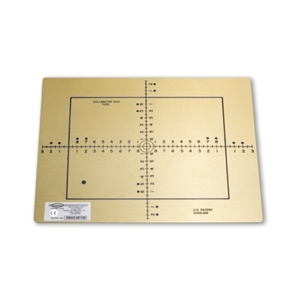 The 805818 is the etched stainless steel baseplate of the Collimator Alignment Test Tool. 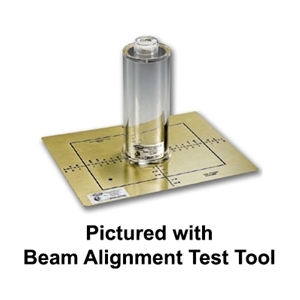 This is typically used with the Beam Alignment Test Tool (800423), to form the Collimator Alignment Test Tool. Users can easily visualize 1 to 2% x-ray beam misalignments without measuring or calculating. Evaluate collimator light field and x-ray field congruence plus ensure accurate x-ray beam alignment. The Gammex 161B Collimator Test Tool is designed to evaluate the collimator light field and x-ray field congruence according to the Center of Devices and Radiological Health (CDRH) specifications. The Gammex 161B is constructed of stainless steel so that centimeter etchings on its surface can give a direct ruled dimension on the radiograph with a normal x-ray exposure. The collimator test tool is calibrated to show misalignments to within 0.5 cm.